Eating seasonally is one of the best ways to thank your community and environment. 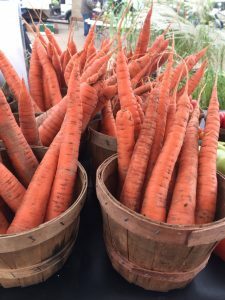 Doing so feels especially whimsical and effortless in the spring, summer, and early fall, when the Holland Farmers Market is filled with beautiful flowers, fresh fruits, and a wide variety of vegetables. But with cold and snow coming, many believe that means the end of eating locally. I’m writing, however, to fill you in on a little secret: The end of the growing season does not signify the end of the abundance of available produce in Holland! As the temperatures are dropping along with your motivation to leave the house, harvest still happens. That’s whats so great about eating seasonally: The season will change and introduce new goodies which create opportunities to try new recipes. This list of late-season items is pulled straight from the Holland Farmers Market website. Anytime you’re seeking up-to-date information about what farmers are offering, visit www.hollandfarmersmarket.com. Knowing what’s available at the market can inspire seasonal soups, roasts, or enticing side dishes for dinners. Make your own soup stock by freezing your vegetable scraps until that icy cold day leaves you craving hot soup. And if you’re craving something sweet, try your hand at making applesauce, crisps, or pies. The Michigan Farmers Market Association has an abundance of great recipes for using seasonal and local produce at this page: www.mifma.org/recipes/. 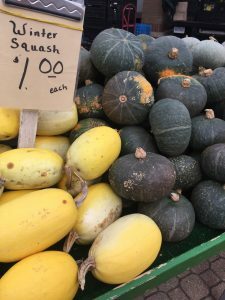 And the Michigan State University Center for Regional Food Systems has put together a guide outlining when different fruits and vegetables are available in our state. Check for the mobile or print-at-home versions at www.canr.msu.edu/foodsystems/resources/. As a reminder, the Holland market also accepts EBT Bridge Cards and Double Up Food Bucks. If you have questions about this program, call (616)355-1138. Although we all might be mourning the loss of those delectable late summer tomatoes, not all is lost. 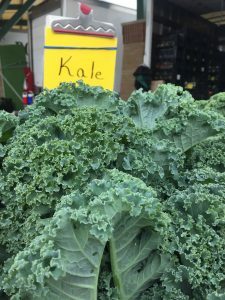 The Holland Farmers Market continues every Wednesday and Saturday until Dec. 22. You’ll find tasty treats like breads, syrups, potatoes, kale, carrots, and beets. Earlier this summer I wrote about the health, environmental, and economic benefits of supporting local growers. Now, although the ground will soon be covered in snow, that doesn’t mean we have to stop supporting our local growers. Visiting the farmers market in the winter is still a fun family activity; you just might need an extra layer on. See you there!  Madison Ostrander studied business and English writing at Hope College. After spending a summer interning on a farm in Holland, her love and passion for sustainable and local living has only grown stronger. Quality of Life: The community, through governmental, religious, business and social organizations, makes decisions that contribute to its own well-being.